May is National Strawberry Month and what better way to celebrate then with some natural goodies from YoKids and Tom's of Maine?! Both of these brands are well represented in our home and I love them both a lot. My kids have only ever eaten Stonyfield organic yogurts. They all started out on the YoBaby line and eventually graduated to YoToddler and now YoKids. I was so thrilled when Stonyfield introduced the YoKids Greek line earlier this year as it is a great way for me to get some more protein into them. 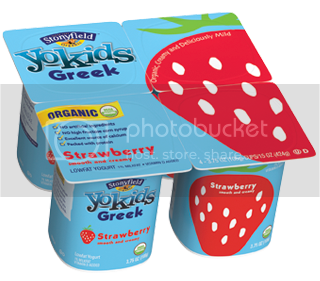 YoKids Greek is the first organic Greek yogurt specially made for kids and comes in two kid-friendly flavors: Raspberry and Strawberry. It is packed with 6 grams of protein to help kids power through their busy day and most importantly it is produced without the use of toxic persistent pesticides, antibiotics, growth hormones, genetically engineered ingredients, or artificial flavors, colors, or sweeteners. My kids also use the Tom's of Maine Silly Strawberry children's toothpaste. It comes in both a fluoride and fluoride-free version and since we have well water and do not take fluoride supplements, we use the fluoride one. Our boys love the flavor and I love that they are brushing twice a day with a natural toothpaste. Each tube of children's toothpaste purchased on TomsofMaine.com will come with an on-pack coupon for $1 off YoKids Greek organic yogurt! You can also save 20% on your entire order with the coupon code: YOKIDS20! Coupon expires on 6/4. 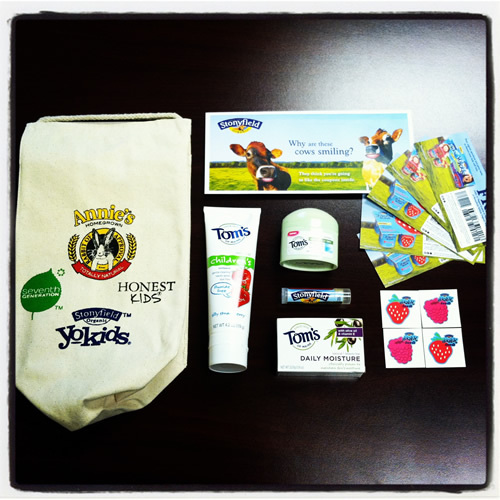 One (1) winner will receive a YoKids lunch sack filled with several Tom's of Maine products including a full 4.2oz tube of Silly Strawberry children's toothpaste, as well as samples of their Naturally Dry deodorant and Daily Moisture soap. The bag also includes FREE YoKids and YoKids Greek coupons, YoKids temporary tattoos, and YoKids Strawberry-flavored Eco Lips chapstick! Giveaway is open to US residents only and ends on June 6 at 12:01am EST. Please use Rafflecopter form below. I love to eat strawberries with a bit of sugar or dipped in chocolate! I like strawberries in a smoothie. Strawberries in a fruit salad are great! I like fresh cut strawberries in a bowl of vanilla yogurt. I like to eat my strawberries with cream. Thank you! chocolate covered strawberries are my favorite...but we also like to dip them in whipped cream. Fresh with whipped cream OR in my Frozen Strawberry dessert. Yummy! I like to eat strawberries with yogurt dip! Strawberries dipped in dark chocolate. I like eating sliced strawberries with greek yogurt and a drizzle of honey. strawberries and nutella ... yum!! I like to eat strawberries in a strawberry pie! I love to eat strawberries when they are dipped in warm chocolate! I love stawberries dipped in chocolate! i love them with whipped cream! I like to eat strawberries with whipped cream! Frozen with sugar. Naughty, huh? My favorite way to eat strawberries is organic, fresh, room temperature, dipped in a nice sweetened dark chocolate sauce! mmm! Just plain, nothing fancy. Strawberries are too good to eat them any other way. With sour cream and brown sugar. I like eating them when they are ice cold from the refrigerator and put a little bit of honey on top.